Obscure puffer (Takifugu obscurus) is an anadromous fish widely distributed around the coastal and inland rivers in East Asia. T. obscurus often encounters fluctuations in temperature and salinity. This study aimed to investigate the effect of the interactions of temperature and salinity on survival and oxidative stress response of newly hatched T. obscurus larvae. A combination of three temperatures (19, 25, and 31 °C) and three salinities (0, 10, and 20 ppt) was applied for 96 h under laboratory conditions. The newly hatched larvae could not tolerate 31 °C for 96 h. No death was recorded at other temperatures during this experiment. Malondialdehyde concentrations increased significantly after 6 h of exposure to high salinity (10 and 20 ppt) and then decreased until the end of the experiment at each temperature. The highest superoxide dismutase activity was observed under the exposure to 20 ppt for 24 h at 31 °C. Na+/K+–ATPase activity significantly increased as salinity increased, especially at low temperatures. With the prolong of exposure time, the integrated biomarker response (IBR) values showed an increase until 48 h and then declined at 96 h in most treatments. 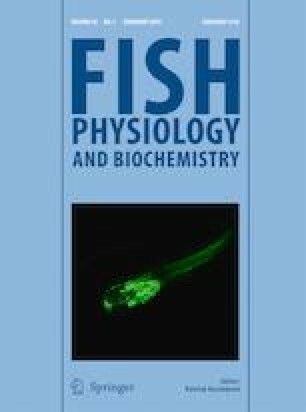 The largest IBR value appeared when larvae were exposed to the highest temperature and salinity for 24 h. Our study indicated that high temperature with high salinity may negatively affect the early development of T. obscurus and their combined effects should be considered in the larvae culture. This investigation was funded by the National Natural Science Foundation of China (31370429) and the Priority Academic Program Development of Jiangsu Higher Education Institutions. All experiments were approved by and carried out in accordance with the guidelines of the Institutional Animal Care and Use Committees (IACUC) of Nanjing Normal University, Nanjing, China (Research permit number: SYXK2015-0028).